Archaeologists are occasionally confronted with ‘mystery artifacts’ that either cannot be identified or have been altered to serve a purpose other than what was originally intended. Recently, in our small finds collection, we identified an artifact transformed in just such a way. 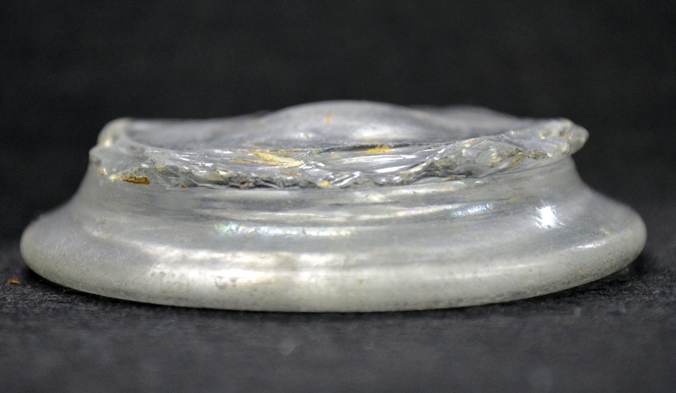 Someone intentionally chipped away the edges of this 18th century leaded glass base for a cup or mug to form a disc. In addition, they also smoothed out the broken edges so they are no longer sharp. For the moment, the object’s purpose is and, may always remain, a mystery. Use-wear on the base’s interior may hint at how it was used after alteration. Numerous scratches in the glass are present on the ‘kick up’- a small bump on the inside of the glass formed when it was hand blown. This is not wear that typically accumulates during the life of a drinking vessel so we know the wear occurred after modification. Oddly enough, while pondering possible uses, a staff member here at Ferry Farm turned it upside down and spun the disc on the table. It whirled around perfectly like a top right where the glass exhibited the extreme wear! Take a look at this video for more detail in how the glass has been broken and smoothed and see how the modified base spins like a top. While this is only speculation, it is possible that we are looking at an improvised toy. 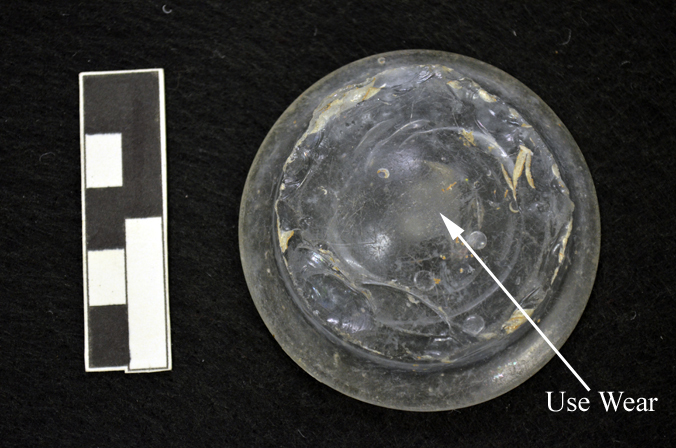 Perhaps a child living at Ferry Farm converted this broken glass into a toy top and played with it for many happy hours before it was lost or discarded and found its way into the archaeological record. We can only assume the child would laugh if they knew that archaeologists would be brooding over their whimsical plaything hundreds of years later.